Make the most of your shore excursion in Dunedin, the oldest city in New Zealand, which boasts impressive sandy beaches and rugged coastlines, is home to rare wildlife including the yellow-eyed penguin and has a fascinating history from its Scottish settlers and proud Maori tribe. This comprehensive full day itinerary takes you to some of the finest lookouts and must-see places in the city of Dunedin and ventures out to explore remote parts of the Otago Peninsula with its stunning coast, rolling sand dunes and a beautifully architected castle. Ashley M: "All in all, it was a fantastic day - I highly recommend this tour group!" Gayle692: "They go above and beyond your expectations"
The notable architecture of the historical buildings are equally as impressive as the natural beauty found along the coastline in Dunedin. This tour allows you to admire both! Dunedin was once the leading industrial and commercial centre of New Zealand and has retained many of its early buildings. Our tour begins with a scenic drive into the city to admire the largest collection of Edwardian and Victorian structures. We also visit Baldwin Street, the “steepest street in the world,” University of Otago - New Zealand’s oldest university, the Historic Dunedin Railway Station. Before heading farther along the bay, enjoy the city’s central plaza with its octagonal layout. The journey continues out onto the Otago Peninsula, where the southern rollers pound our coastline and rare wildlife comes ashore regularly throughout the year. We visit Larnach Castle gardens, where a unique collection of specialised gardens can be explored and some of the finest views of the Otago Harbour can be seen. Please note that lunch is not included however you will have the opportunity to purchase something from the Larnach Castle ‘Ballroom Café’ or later on during the tour. If you have any dietary requirements, please let your guide know on the day of the tour. After your Larnach Castle experience, we follow the winding gravel roads towards Portobello, the main township on the Otago Peninsula. On the way, we visit the Tidal Inlets and learn about this fascinating eco-system and the waders and waterfowl that rely on it. View native birds of New Zealand feeding on rich mudflats and see some of the finest scenery along this rugged coastline. Continuing on, we’ll spend the afternoon viewing the unique and treasured penguins and other native wildlife that call the coasts of New Zealand home. We take an adventurous journey through a series of tunnels and hides to get unrivalled viewing of the ‘critically endangered’ Yellow-Eyed Penguin. We’ll also see Little Blue penguins, NZ Sea-lions and NZ fur-seals who come ashore regularly. Grab your cameras, you can expect to see at least two of these species during the afternoon! 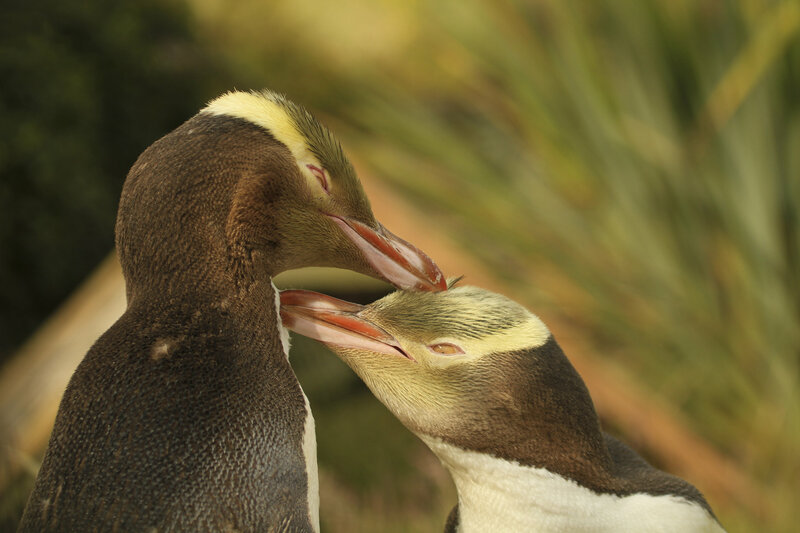 This Dunedin penguin tour provides you with fantastic photographic opportunities and introduces you to arguably the rarest penguin in the world. The 90 steps to climb and 600 meters to trek will take approximately 90 minutes, and the rewards are immeasurable. Our final stop is at Taiaroa Head, where the Northern Royal Albatross can often be seen gliding around the headland. Our guide will tell you the story of a truly amazing bird that spends most of his life at sea, and chooses the tip of the Otago Peninsula to breed. The surrounding area is also full of interest, and a perfect way to finish the day, before taking the low road back to Port Chalmers.